Radio shows in which I answer quiz questions, sing, and tell the story of how I wrote OCEAN AT THE END OF THE LANE for Amanda are like buses. You wait for such a long time, and then two come along at once. I love that two shows, recorded many weeks apart, went out at the same time. Quite literally. And many Public Radio stations put them out back to back. So it must have seemed to listeners that this writer they had never heard of had just taken over their radios. Probably they were disappointed when I wasn't then to be heard singing something on the News from Washington. The first one I recorded was ASK ME ANOTHER, at the 92nd st Y. Ophira Eisenberg and Jonathan Coulton tormented me with their evil questions and singing tests. It was amazing. And you can watch this bit. I had told their interviewer that I won tickets to see Patience from the local paper's Gilbert & Sullivan competition when I was 9. So they did a Gilbert & Sullivan competition for me, with the assistance of Jonathan Coulton playing things on guitar that were never meant to be played on guitar. Then last week I flew to Minneapolis to be on WITS, with musical guest Shara Worden AKA My Brightest Diamond (whoa, can that lady sing). I found myself in comedic sketches, including one where I show people around an extremely unusual house. And I read out people's Bad Gaiman submissions. And I sang a verse of FEVER. I went to Germany and Austria, and did book events and signings for Der Ozean am Ende der Straße. I went to Paris and did book events and signings for L'océan au Bout du Chemin. I came back to America and went to New York, where I talked at the New York Public Library about life, the universe and Hansel and Gretel, while dressed as dead Charles Dickens. (You can watch or listen to the whole of that evening's interview with NYPL's own Paul Holdengraber at http://www.nypl.org/events/programs/2014/10/31/neil-gaiman-paul-holdengr%C3%A4ber). Written with a devastating spareness by Neil Gaiman and fearsomely illustrated in shades of black by Lorenzo Mattotti, the newest version of “Hansel and Gretel” astonishes from start to finish. It doesn’t hurt that the book itself is a gorgeous and carefully made object, with a black floral motif on its pages’ decorated borders, along with abundant red drop caps and tall, round gray page numbers. 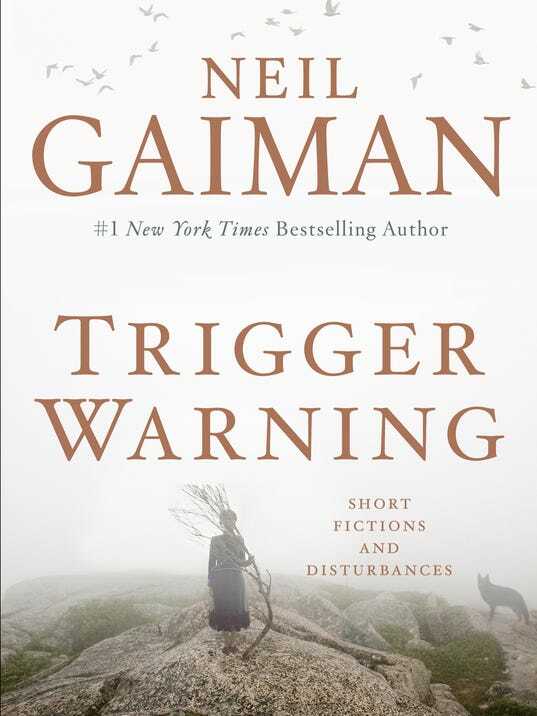 ...All the well-chosen detail provides an ideal backdrop for what Gaiman and Mattotti have done with the Grimm Brothers’ familiar story of the two siblings who, after being abandoned by desperate parents, outwit their witchy captor. Their rendition brings a freshness and even a feeling of majesty to the little tale. Some great, roiling essence of the human condition — our fate of shuttling between the darkness and the light — seems to inhabit its pages. Which is really rather wonderful. When the picture was first seen we were criticised for writing a lesbian version of Snow White and Sleeping Beauty, and now people have read the story I've seen us criticised for not writing a lesbian version of Snow White and Sleeping Beauty. Neil Gaiman’s striking novella, The Sleeper and the Spindle, out this month, conflates and subverts Snow White and Sleeping Beauty into a tale of female courage and choice. So two beautifully illustrated fairy tales came out on each side of the Atlantic. But that wasn't the big book excitement in the household. Nope. The big excitement was yesterday, when my wife, Amanda, became a published author with her first book. This is the cover. She spent the year writing it, following on from her TED talk of the same name, and it's just been published, on 11/11, by Grand Central. It's a remarkable book -- it's partly a memoir, partly a manifesto on crowdfunding and music and art, partly the story of our marriage and her friend Anthony's struggle with cancer and what that meant to Amanda's life and career. It's the story of how she did the most popular musical Kickstarter ever, and the weird and improbable shapes and twists her world has taken. It's about how we ask for things. It's about being vulnerable. First books are strange beasts. They are rougher than the books that follow (usually), but they are also full of literally everything that the author ever, over the course of her entire life, thought worthy of inclusion in a book. All subsequent books will be full of the things the writer came up with after she started publishing. The first one, that's got everything from the other side of the divide. Palmer is a good writer, and in places she's great. She has a loose and at times meandering structure that usually works, except when it doesn't. As a literary work The Art of Asking is pretty good. But as a manifesto and a confessional of an artist uniquely suited to her time and place, it is without parallel. What Palmer's story tells us is that asking, trusting, and giving are hard and terrifying, and you face real risk every time you do them. Palmer receives death threats, is stalked and sexually assaulted by fans, is terrorised by fans who threaten suicide to command her attention. Palmer doesn't make it look easy, this business of being public and naked. She makes it look hard. The Art of Asking is an inspiration because Palmer never tries to hide the scuffed duct-tape holding her life together. Instead, she takes us by the hand and insists that we look at this 21st century artistic business model with open eyes and realistic expectations. Which is the truth. It's also a very funny book. As Cory says, she's put everything in here. She's also having to deal with the very real problem of Amazon in the US not stocking the book, due to their ongoing contract-battle with her publisher, Hachette. You can buy it from Barnes and Noble, with free shipping from Powells, or you could use Indiebound to find it or buy it from a local independent bookshop. But if you think you may want it, or if you know anyone who will want it for as a holiday gift... BUY IT THIS WEEK. Get it now. The bestseller rankings matter, and without the Amazon sales (they tend to be about half of a book's sales in the US) it's going to be much harder for her. I was on WITS last week. I believe it will go out in podcast form on Friday Afternoon. This is not to be confused with ASK ME ANOTHER, recorded many weeks ago, which also goes out in podcast form on Friday Afternoon.